Mazzoni Center and the Delaware Valley Legacy Fund are pleased to announce the 2019 David M. Rosenblum, Esq. Memorial Award. The awards (ranging from $400 to $1,500) are given to help recipients attend the National LGBT Bar Association’s Lavender Law Conference and Career Fair. The 2019 conference and career fair will be held in Philadelphia from August 6-9. Lavender Law is a national legal education and networking conference for LGBT and allied lawyers, law students, judges, and professors. Philadelphia-based law students and recent law school graduates from the Greater Philadelphia region are eligible to apply for the Award, which is intended to cover or defray conference registration, transportation, and lodging. 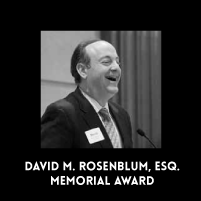 This Award is made possible through the generosity of donors who have made gifts in memory of David M. Rosenblum, Esq., Mazzoni Center’s former Legal Services Director. Rosenblum was a passionate advocate for the LGBTQ community, as well as a dynamic educator and convener. From 2011-2014, he led Mazzoni Center Legal Services, which provides legal services tailored to address the needs of low-income LGBTQ individuals while also working to advance the rights of LGBTQ individuals and families. Philadelphia-based law students or recent law school graduates from the Greater Philadelphia region are eligible to apply for the award, which is intended to support and defray conference registration costs, transportation, and lodgings (the conference’s discounted hotel rates have not been announced). Please submit this application (Linked below) by Friday, February 15 5:00 p.m. to Larry Benjamin, Director of Communications at [email protected]. Qualified candidates must originate from the greater Philadelphia region and/or attend/have attended a law school in the greater Philadelphia area.